Well, fall (and soon winter) is officially upon us! The famously overcast skies of the Northwest have reappeared and we finally cranked up the wood stove this week. I'm so cold all the time but a warm cocktail is just the thing to warm me up. This recipe is in honor of a past Beauties trip to the Chocolate Show in NYC - I loved the spicy hot chocolate we were served there. Cheers! In a saucepan over low heat add the cocoa powder, cinnamon, chili powder and cayenne pepper. Toast until spices begin to release their aromas, just a couple of minutes. Using a small whisk or wooden spoon, slowly incorporate the milk. Raise the temperature to medium-high and bring to a slow simmer. Stir in the honey and remove from the heat. 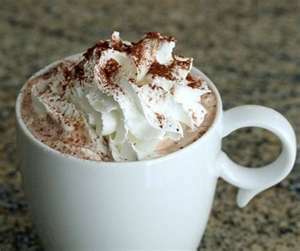 Pour in the tequila in a mug and add the hot cocoa mixture. Top with whipped cream. Makes one serving but you probably want to make more and share. That photo is making my mouth water! Even though I was on that NY trip, I never would have thought of putting tequila in hot chocolate! Sounds so good with the spices... I may be trying this tonight! The ingredients in this look soooo good! Can't wait to sip on this on a cold day.